A chance to buy your new season's wardrobe - and have a great night out as well! If you've been to one of our Lucy Cobb Fashion Shows before, you'll know what a good evening out it is. 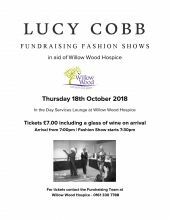 A chance to have a complementary glass of wine with your girlfriends while the lovely models show Autumn and Winter day and party wear to their best advantage - what could be nicer! It's held in our Day Services Lounge with the fashion show itself starting at 7.30pm, although you are welcome to arrive from 7pm. Its a lovely evening out, so book now - all our previous Lucy Cobb shows have sold out fast. Just ring our fundraising department on 0161 330 7788.